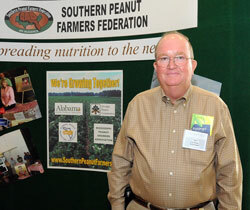 One of the newest peanut groups to participate in the conference is Mississippi Peanut Growers Association. Their president is Joe Morgan, M&M Farms. He says they have just hired a part time executive director. Joe says growers felt there was a real need to create an organization to represent them and help promote Mississippi peanuts. He says things are going well. They’ve got over 25,000 acres of peanuts in the state now. Joe says the crop looks good right now after some early wet spots.